Edison, NJ, 17th Apr, 2012, Stellar Data Recovery a prominent name in data recovery software & services today launched the updated version of its EDB to PST converter v2.5 a professional tool that converts MS Exchange files to Outlook Data files. Edison, NJ, 29th Feb, 2012, Stellar Data Recovery leader in data recovery software and services today launched the updated version of Stellar Phoenix Mailbox Exchange Recovery v5 to repair corrupt or inaccessible Exchange Database(s). Edison, N.J., 21st Sep 2011, Stellar Data Recovery, a well acclaimed name in data recovery products and services today announced the release of Stellar Phoenix EDB to PST converter; DIY software that converts MS Exchange database (EDB) files to Outlook Data files (PST) in offline and online mode. 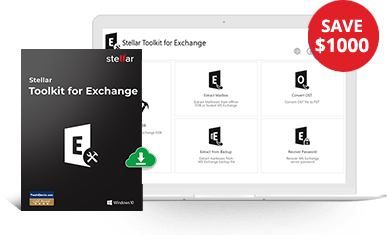 Edison, N.J., 03th Aug 2011, Stellar Data Recovery a well acclaimed name in recovery products and services today announced Exchange BKF repair utility Stellar Phoenix Exchange BKF Recovery v1. Stellar Phoenix repairs corrupt or damaged Microsoft Exchange Server BKF Files and supports to recover BKF files of Exchange Server 2007 & 2003.